The coastal regions of Alaska are beautiful, but to see some of the most interesting cities and sights, you need to explore further inland. That's why Royal Caribbean created Cruisetours, a combination of an exciting cruise vacation and a multi-night land tour that allows you to experience all that Alaska and Canada has to offer. Take in the scenery, local flavor, cultures and historic landmarks all while traveling by deluxe motorcoach or train and staying in some of the finest and best-located hotel properties. And the best part-- you can choose to take the land portion of your vacation either before or after your cruise. To learn more about our cruisetour destinations and packages, choose a link below or download our brochure on Alaska & Canada Cruisetours. A Cruisetour is the best of both worlds. It combines a fabulous cruise with an exciting land tour into the heart of Alaska and Canada. 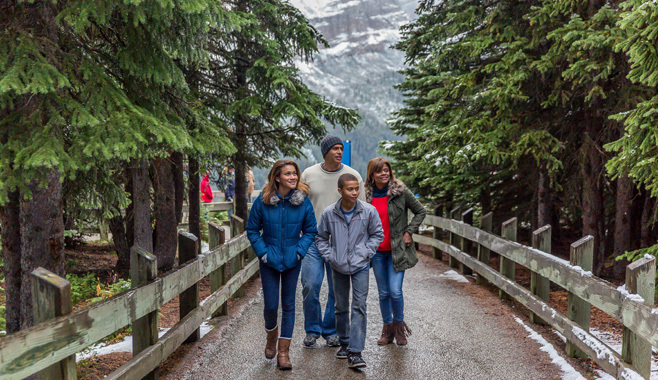 If it's the lure of the Canadian Rockies that inspires you, choose our 6-night land tour package that visits Calgary, Banff, Jasper, Vancouver and Victoria. Pass through beautiful mountain ranges and seaside towns; witness wildlife in their natural habitat on one of our Alaska cruisetours.